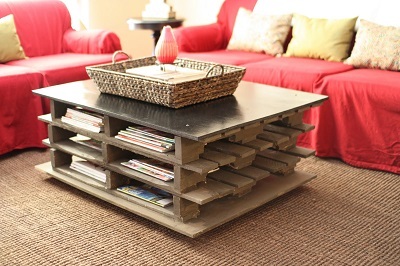 Used wooden pallets are an immense gift to creative people who love DIY projects. Whether it is on your own, with your children or with a group of friends or relatives, there are so many imaginative things you can do with used wooden pallets which can enhance your home and your life at minimal cost. The challenge is not to come up with concepts but to look at the many ways people recycle wooden pallets and pick out the best ideas. It hasn’t been easy, but here we have selected some of the most amazing things people have created with wooden pallet craft to help inspire you. Most people have probably never looked at pallets and thought ‘hammock’, but that is what one teenager did. Using pallet blocks and some pallet planks, this enterprising young person created a frame for a comfy spot to relax in on a lazy afternoon. Of course, the fabric sling must be found separately, but having a spot to put it is the critical component. A desk is always useful, and some wooden pallet DIY can easily yield a versatile workspace. Just screw on some recycled table legs, or even construct legs from another section of pallet, and you are ready to go. Some keen crafters have even made desks with drawers. While on the subject of tables, wooden pallet craft also lends itself to making a handy place to put your laptop. Improve your posture and make computer work easier with a table you can put together to suit your unique measurements and style of typing. Additionally, you can customise your table to suit your personal aesthetic, whether it is minimalist or you like something more decorative. Panelling can make a room cosy or create a den-like or rustic ambiance, depending on how the panels are assembled and finished. Repurpose some wooden pallets into planks for the wall and you could have a whole new look for part of your home. Mix and match different kinds of wood, finish and stain for a result that is individual, has lots of character and will cost a fraction of what you might pay otherwise. While you are at it, you could probably make some shelves to match. In this conveyor-belt world, friends and relatives adore it when you make something for them. Trim some pallet boards to make a circle, or even a square, fashion some numbers from scrap metal and attach a mechanism that is available at most craft outlets and you have a handsome clock, made with love, that would be a memorable gift. It is even possible to make pens from pallets – you just need a belt sander, a saw and a drill. Put a nib and ink in your distinctive wooden pen and you can use it to sign the gift card that accompanies the clock. Another wonderful idea for used pallets is to make frames for mirrors. These would make terrific gifts or be a wonderful addition to the home. Cut down pallets to make frames and the applications are endless – big statement mirrors, a series of mirrors joined together, matching small mirrors or mirrors to fit specific spaces. Stain and polish your mirror frames for a unique finish. Before embarking on any kind of wooden pallet DIY, you need to obtain your raw materials. Sometimes it is possible to find suitable pallets lying around outside a store such as a supermarket which receives large shipments of goods, but they may not be in great condition. The easiest and most reliable way to ensure a consistent supply of your favourite craft material is to contact a specialist such as Associated Pallets, who stock a range of pallets and can even deliver.